Each week we celebrate one of our successful self-publishing authors with our special Author Spotlight post. This week Outskirts Press proudly features Dr. Clay Lifto, author of five published titles. Dr. Lifto inspires, encourages, challenges, amuses, and entertains his readers as he shares stories from his life, lessons he has learned through years spent in military service and creates a platform for contemplation through anecdotes and questions for reflection. Dr. Clay Lifto comes from a military family and has served at Kirkwood College since 1982, where he is now Professor Emeritus of Marketing and Management. Since 1993, Dr. Lifto and his wife Ruth have been involved with missionary humanitarian projects in Ukraine, where they have been teaching, and helping to establish Family Centers for medical and dental care, clothing and food distribution, and post-prison counseling. Dr. Lifto speaks four languages and holds an AA and BS in Business Management, a master’s degree in Education, and a doctorate in Pastoral Leadership. Nobody understands what it feels like to be a soldier…except another soldier. In Only a Soldier Understands, Vietnam veteran Dr. Clay Lifto examines his early days in the Army, sharing feelings and milestones that are universal to young men and women entering the military and finding their identity. 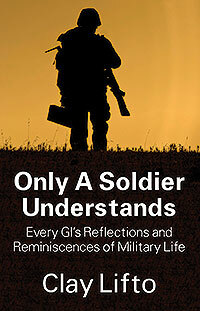 This book takes a look at the deeply personal journey of a new soldier. It’s about family back home, and gaining their respect. It’s about living far from home and feeling lonely. It’s about good and bad bosses. It’s about successes and failures, excitement and frustration. But most of all, it’s about gaining insight and perspective about your life-changing experiences. Told in a series of short anecdotes full of humor and honesty, this book offers you the opportunity to compare and contrast your own feelings and facts, and provides questions designed to help you delve deeper, as well as compassionate advice from the best Commander of all. If you’re stuck in a particular place in your career, the Table of Contents can guide you to the section you need most right now. But each of the 37 stories has something valuable for you. Equally relevant to both the new recruit and the career soldier, Only a Soldier Understands gives you a mentor you can trust, and a colleague who’s been where you are. Clay Lifto knows what it’s like to be a soldier. In Book 2 of Only a Soldier Understands, he continues the journey past basic training into the next phase of the adventure. With his trademark warmth and candor, Clay shares his story in 38 short anecdotes, covering ground that will resonate with readers. Topics include adjusting to being away from family, gaining respect among peers, finding success after failure, feeling lonely, moving to new places, and discovering women. It’s about breakthroughs and dead ends, excitement and frustration. As Clay’s stories bring back memories of your own experience, each anecdote ends with a series of thought-provoking questions designed to allow reflection on your personal experience. This book is for the new recruit, the career soldier, and the veteran. It’s for anyone who has served in the military—and it’s a great book to share with friends, to exchange stories and thoughts. You don’t even need to read it in chronological order…the Table of Contents provides detailed guidance if you’d like to target a specific area of your career. This book is personal. And it’s about you. Nobody understands what it feels like to be a soldier except another soldier. It’s about your family back home. It’s about trying to gain respect. It’s about achieving something important after feeling like a failure. It’s about living far from home and feeling lonely. It’s about discovering women. It’s about good and bad bosses. It’s about successes and failures, excitement and frustration. Sound like you yet? And the book will bring back memories. I’ll share my story while you reflect upon your own. In fact, it will draw you back to your childhood, and spur visions of your future. No soldier’s story is dull if you have a sense of humor. And you’ll laugh at my story as well as your own as we quickly turn the pages together. It’s an easy read, too. Stories of my life in the military are a quick, two-page read for the most part. I follow up with a few questions directed to you about your own story. That’s why sometimes a bunch of guys might get together over lunch and read some of these together. It gets you laughing and sharing about your own journey down the road. Clay Lifto knows what it’s like to be a soldier. In Book 4 of Only a Soldier Understands, he branches out into a new phase of his military experience, past the Middle East, and into deployment…in Vietnam. In 38 short anecdotes, Clay explores not only the physical realities of deployment, but also the emotional and psychological growth and challenges that come from experiences ranging from being under fire from the enemy to discovering a disheartening need for dental work. Money management, a last visit home, a girlfriend, R & R in Australia, homesickness, and fear and panic in combat are all discussed with Clay’s trademark warmth and candor. The topic of Vietnam vets’ horrible homecoming is a particularly important piece of Book 4. As Clay’s stories bring back memories of your own experience, each anecdote ends with a series of thought-provoking questions designed to allow reflection on your personal journey. The Only a Soldier Understands series is for the new recruit, the career soldier, and the veteran. It’s for anyone who has served in the military—and they are great books to share with friends, to exchange stories and thoughts. You don’t even need to read this book in chronological order…the Table of Contents provides detailed guidance if you’d like to target a specific area of your career. Clay Lifto knows what it’s like to be a soldier – not the great hero, but an ordinary guy performing his duty, raising his family and trying to live the Christian life. In this 5th book in his series, Only A Soldier Understands, he becomes a bit reflective in his personal story as he shares some life lessons he learned as he enters the Army a second time. He branches out into a new phase of his military experience, past the Middle East, past Vietnam, and into the spy games of the European Cold War. As the chapters of Clay’s life continue, he shares amazing things that can happen in a soldier’s life when he makes a commitment. Not a lecture, not a Bible study, just a personal story of God’s grace. Clay explores not only the physical realities of deployment, but also the emotional and psychological growth and challenges that come from experiences ranging from finding the woman of his life to frustrations with civilian life to the relationship with his family back home to breaking up with his wife to surrendering to the truth about himself and his own life to getting into a job far over his head to finding his true calling in life. As Clay’s stories bring back memories of your own experience, each chapter ends with a reflection of a major lesson in life that he learned – maybe a lesson you could apply to your own personal journey in life. The Only a Soldier Understands series is for the new recruit, the career soldier, and the veteran. It’s for anyone who has served in the military—and they are great books to share with friends, to exchange stories and thoughts. You don’t even need to read this book in chronological order…the Table of Contents provides detailed guidance if you’d like to target a specific area of your career. And if you enjoy this book, go back and read Books 1, 2, 3, and 4 in the series, and look forward to new books by Clay Lifto, coming soon. Previous Previous post: The USA Book News Best Book Award Submission Deadline is This Friday!